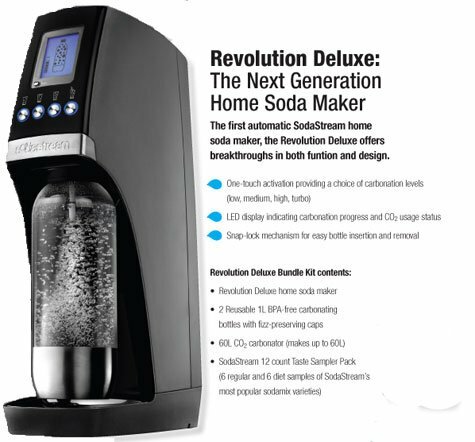 The Revolution is the first automatic SodaStream home soda maker, the Revolution offers breakthroughs in both function and design. Featuring One-touch activation providing a choice of carbonation levels (low, medium, high, turbo), an LED display indicating carbonation progress and CO2 usage status, and a Snap-lock mechanism for easy bottle insertion and removal. Turn water into sparkling water and soda in seconds with a Sodastream Revolution home soda maker.